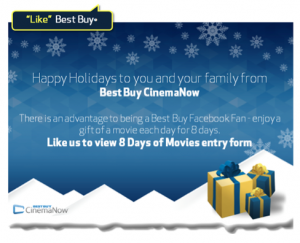 Free movies are always fun and Best Buy is at it again with a free movie code to Cinema Now! “Like” Best Buy on Facebook & enter your email address. If you’re one of the first 60,000, Best Buy will email you a movie download code within 24 hours. No one’s going to say no to a free movie so get your code quick.